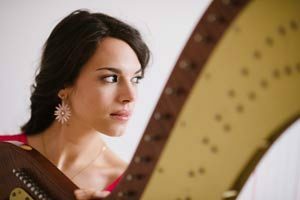 Mélanie Genin, a native of France, was noted as a “singular harp virtuoso, with an exquisitely sensitive playing” (Epoch Times) after her recent debut at Carnegie Hall in the International Shining Star series, and as a “very promising soloist to follow” (Classic info) at the Festival des Flâneries, France. In 2014 Ms Genin is the only harpist in finale of the Concert Artist Guild competition and in the semi-finales of the International Young Concert Artist Audition. Passionate and dedicated chamber music player, she forms with the flutist Mathilde Calderini (1st prize winner of the Kobe Flute Competition, Japan) the Duo Galilée. Ms. Genin is very dedicated to gaining a larger audience for the harp and developing its repertoire. A fervent advocate of new music she has commissioned several pieces, and premiered several works of composers such as Wei-Chieh Lin, Jules Matton and Yuri Boguinia. She cherishes all genres of music and styles of performance, from the classic concert format to underground venues, new music, contemporary improvisation and collaborations with jazz artists. Keen to sharing with the community and aware of the importance of art in our society, she enjoys particularly working with organizations for underprivileged children. Since her arrival in New York in 2013 she has performed with various ensembles such as Evermay Chamber Orchestra, New England Symphonic Orchestra, Metropolis Ensemble,TAK ensemble, MIse-en Ensemble, Tactus, New Juilliard Ensemble, The Sheep Island Ensemble, Sugar Hill Ensemble, DCINY, and currently serving as a member of the Metro Chamber Orchestra and the contemporary ensemble ECCE. As an orchestral player she has performed in some of the most prestigious halls in the world, including Concertgebouw Amsterdam, Royal Albert Hall London, KKL Luzern, Audi Hall München, Carnegie Hall, Alice Tully Hall, Salle Pleyel, Théâtre du Châtelet, Théâtre des Champs Elysées, under such conductors as Pierre Boulez, Sir Mark Elder, Alan Gilbert, Pablos Heras-Casado, and Leonard Slatkin. Ms. Genin received her Bachelor’s and Master’s degree from the Conservatoire National Supérieur de Musique et de Danse de Paris, where she studied with Isabelle Moretti. She received a special scholarship from the Bruni-Sarkosy Foundation to study abroad at the Juilliard School with Nancy Allen. She was in 2014 the first harpist ever admitted into the Artist Diploma program at Manhattan School of Music, where she studied under the guidance of the late Deborah Hoffman, Susan Jolles and Mariko Anraku. Visit Mélanie Genin’s official website for more media and information. 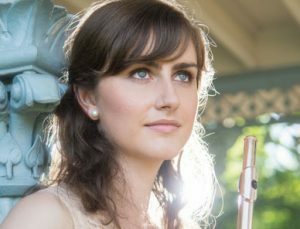 Praised for her “rich and fully present” sound (The New York Times), New York City-based Australian flutist Catherine Gregory enjoys a diverse career as an orchestral and chamber musician, soloist, recitalist and teaching artist. The recipient of numerous prizes and awards, including a Fulbright Scholarship, a BCC Emerging Artist’s Fellowship and an American Australian Association’s Dame Joan Sutherland Fund grant, Catherine has been a winner of the Pittsburgh Concert Society Competition, James Carson Flute Competition, Carnegie Mellon University Baroque and Concerto Competitions, and the Golden Key Visual and Performing Arts Achievement Award. She has performed at Carnegie Hall, The Kennedy Center, Alice Tully Hall and at the Lincoln Center Festival. Catherine’s solo engagements have included appearances at the Dame Myra Hess Memorial Concerts in Chicago, the National Gallery of Australia, the Australian-American Fulbright Commission in Washington, D.C. and the 10th International Flute Festival of Chile. She has been a finalist in the Young Performer’s Awards, performing live on ABC Classic FM. Catherine has appeared at the Mt. Desert Festival of Chamber Music, Chestnut Hill Concert series, Summit Powder Mountain Chamber Series and with the Jupiter Symphony Chamber Players. She is a frequent collaborator with ECCE, NOVUS NY, Ensemble LPR, the Locrian Chamber Players, NOW Ensemble, Riverdale Sinfonietta, Metro Chamber Orchestra and has been a guest of the Springfield Symphony and Orpheus Chamber Orchestra. In Australia, she has appeared with the Southern Cross Soloists, and has also performed with the Paris Opera Ballet on their Australian tour, with the Australian Chamber Orchestra and the Queensland Symphony Orchestra. She has played under the batons of such conductors as Harry Bicket, Robert Spano, David Robertson, Susanna Mälkki and Marin Alsop. Catherine’s repertoire spans from the Baroque to the present day. She has collaborated with such composers as Steve Reich, David Lang, Missy Mazzoli and The Brothers Balliett. Passionate about education, community outreach, and musical advocacy, Catherine is an alumna of Ensemble ACJW: A Program of Carnegie Hall, The Juilliard School and The Weill Music Institute in Partnership with The New York City Department of Education, and continues this work with the Alumni group, Decoda, an affiliate ensemble of Carnegie Hall. Catherine graduated with First Class Honours and the University Medal from the Queensland Conservatorium, Griffith University under the tutelage of Gerhard Mallon. After receiving her Masters degree with High Distinction, which included studies with Sally Walker, Catherine earned her Artist Diploma at Carnegie Mellon University (USA) where she studied with Alberto Almarza and Jeanne Baxtresser. Catherine has held the position of Artist-Lecturer of flute at Moravian College since 2015. Visit Catherine Gregory’s official website for more media and information. 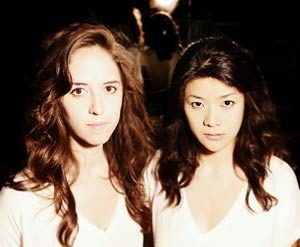 As RighteousGIRLS, New York-based flutist Gina Izzo and pianist Erika Dohi “Rattle speakers and expectations with stop-time razzle, vocal (flute-talk) and electronic (phaser) effects” (NYC Jazz Record) while continually expanding their creative reach by bringing 21st century music to new audiences and commissioning works that root themselves in classical idioms but draw from other genres. RighteousGIRLS recently performed as part of Vicky Chow’s “Contagious Sound Series” at the Cornelia Street Café, and at venues and festivals such as SubCulture, the DC Jazz Festival, the Jazz Gallery, the Yamaha Piano Salon, An Die Musik, Bohemian Caverns, The ArtsCenter, Rockwood Music Hall Stage III, the Atlas Performing Arts Center, and Joe’s Pub at the Public Theater. Over the past year, RighteousGIRLS have performed in collaboration with various artists stemming from the New York Downtown music scene. Some recent projects include a music video of composer Andy Akiho’s “NO one To kNOW One” filmed by videographer Michael McQuilken at the “Original Music Workshop” in Brooklyn, released by Vic Firth. RighteousGIRLS was recently featured by New Music USA at SubCulture alongside Steve Coleman & the Five Elements, Rudresh Mahanthappa and the Prism Quartet, and Wet Ink Ensemble. RighteousGIRLS have also been featured artists in viral videos presented by CDZA. Gina Izzo has participated in international festivals including Centre d’arts Orford in Montreal, Canada, and Les Nuits Musicales de Nice, France. An active orchestral musician, she has performed under conductors like Kurt Masur, Eric Jacobsen, JoAnn Falletta, Alondra De La Parra, and George Manahan. Izzo has performed at the Umbria Jazz Festival and Jazz at Lincoln Center, and appeared at Carnegie Hall, Merkin Concert Hall, the Stone, SubCulture, and the Jazz Standard. She has also worked as coordinator of New York’s Cutting Edge Concerts New Music Festival at Symphony Space and Chamber Music America’s New Music at Bryant Park Series. Erika Dohi has made appearances at international festivals including the Montreal Jazz Festival (Canada), Washington DC Jazz Festival (U.S), Banff International Workshop in Jazz and Creative Music (Canada), International Society of Improvised Music (U.S) alongside Wadada Leo Smith, the Tokyo Experimental Festival (Japan), and Norfolk New Music Workshop (U.S). Additionally, she has performed with contemporary ensembles including Contemporaneous, Ensemble Moto Perpetuo, Le Train Bleu, Ensemble LPR, and the Metropolis Ensemble. Gina earned her BM from the Manhattan School of Music and MM from New York University. Erika earned her BM and MM from the Manhattan School of Music and is currently pursuing a doctorate at Stony Brook University. Visit the RighteousGIRLS’ official website for more media and information. American Modern Ensemble spotlights American music via lively thematic programming, performing a wide repertoire by living composers. The mission of AME is to create definitive performances of the highest caliber for the widest possible audience base. It supports its mission by presenting live concerts, making recordings, and presenting premieres. AME always includes on-stage chats with composers, and conducts an annual competition for composers of ALL ages. Winners receive a performance with a recording, videography, and cash awards. Founded in New York City in 2005 by Robert and Victoria Paterson, Robert serves as artistic director as well as house composer, and Victoria is Executive Director as well as one of the violinists on the roster. Made up of NYC’s finest, AME is “simply first-rate” (The New York Times). Sold out crowds at Merkin Hall, the Rubin Museum and SubCulture are a winning testament to a ten-year track record, as one of the top leaders in successful programming. AME does educational and outreach concerts at universities such as the CUNY Graduate Center, Princeton University, Adelphi, James Madison, and many more. Recent collaborations include the Cutting Edge New Music Festival, Prototype Opera Festival, American Opera Projects, the Dance Theater of Harlem, and the Mazzini Dance Collective (Paul Taylor lead dancer/choreographer). AME presents thematic programs using a robust combination of instrumentalists, vocalists, and conductors. Visit AME’s official website for more media and information.